Food is good, but in my eyes it is better in bite size;-) Why?? because you can try more things, and not feel so guilty, plus bite size food is easier to serve than dips at parties! 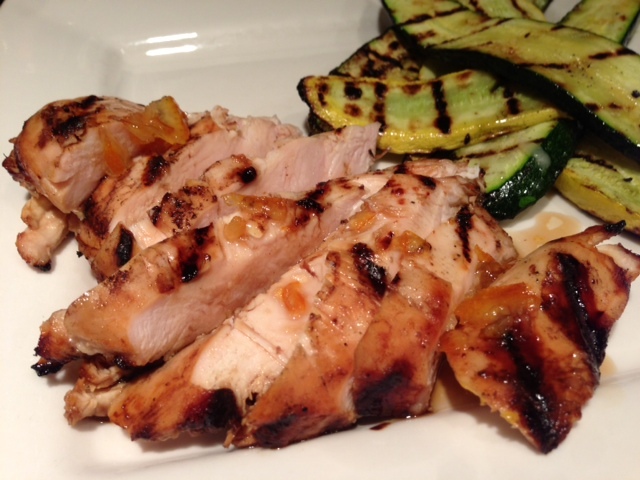 A few days ago I was browsing the internet and I came across this recipe of Buffalo Chicken. I am not much into spicy food so I would have normally passed this recipe, but it was so cute that i had to try. Well it was a hit at home with the kids. They loved, loved, loved it!!! 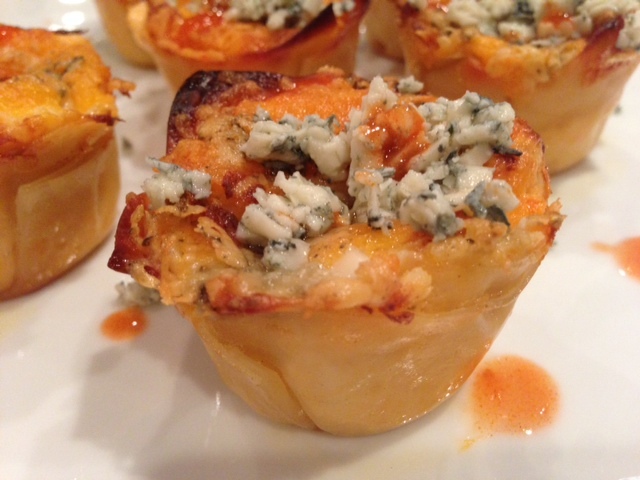 Next time you have guests over for appetizers, or for tailgate give them a try. and about 1/4 cup of gorgonzola cheese. Sprinkle a bit of salt, place the octogonal silpat on top and microwave it for 5-6minutes. Set the chicken aside to cool and prepare the rest of the mixture. 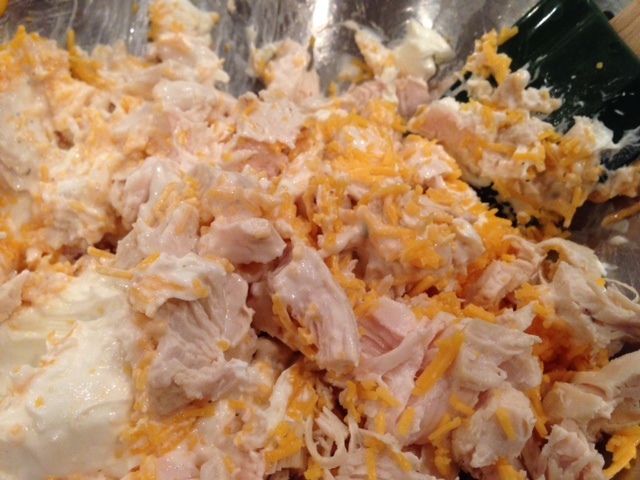 Into a large bowl pour in the cream cheese, 1 cup of cheddar cheese, buffalo wing sauce, salt, pepper. Mix well. 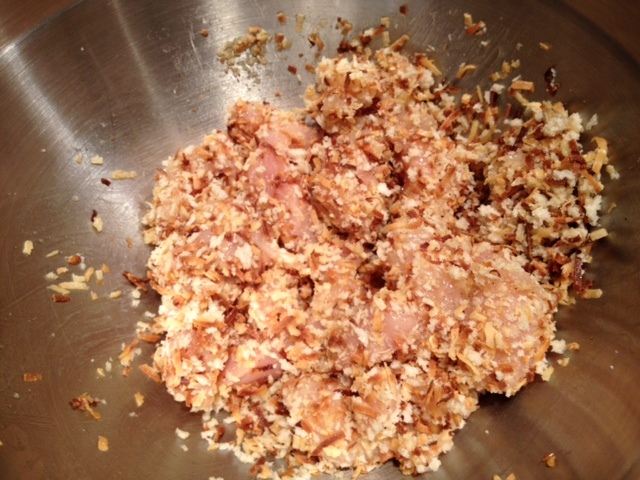 Shred the chicken and add it to the mixture. Set aside. 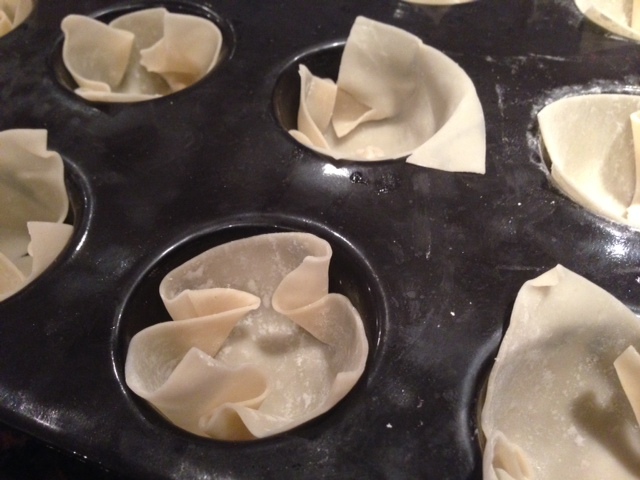 With a small cookie cutter cut two small circles in 10 wontons. set aside. place the mini cupcake tray on the perforated sheet. 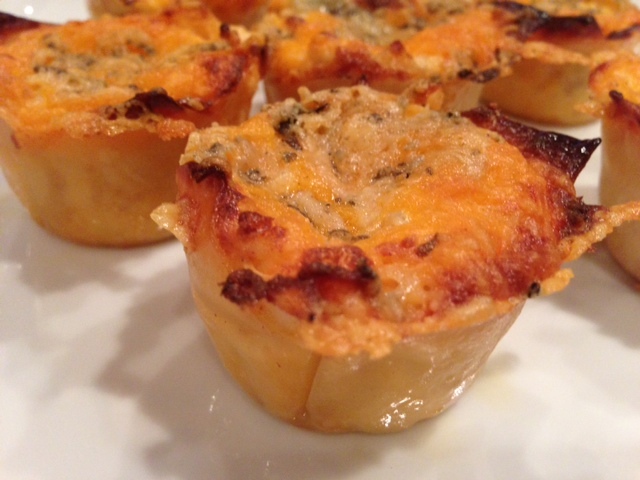 Place one wonton in each mini cupcake hole. Fill the chicken mixture to half, place one round, or circle ( that you would have previously cut in your wonton) and top this round with the chicken mixture all the way to the top. 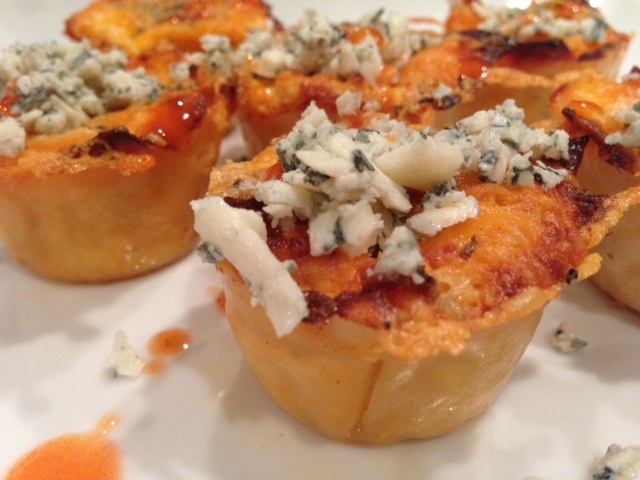 Sprinkle with some cheddar cheese, then some gorgonzola cheese. Bake the cupcakes for 12-15 minutes or until the top is nicely crusted. 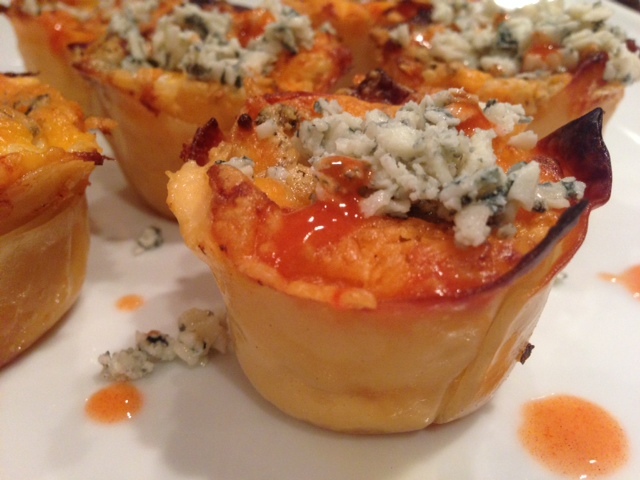 As soon as you are removing the cupcakes from the oven, sprinkle more gorgonzola cheese, drizzle some buffalo sauce and eat up!!! Miam, Miam, Miam!!! I love Italian food, great Italian food. I love to eat it and I love to fix it. 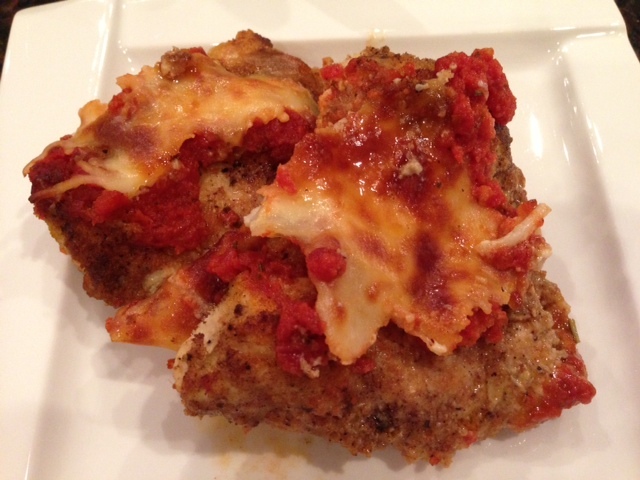 So how did I learn to make good Italian food? Well the answer is very simple. I learned it from my first boyfriend’s grandmother. She was Sicilian and she taught many wonderful recipes such as Gnocchi, Fresh Pasta, Osso Bucco and Chicken Parmigiano. 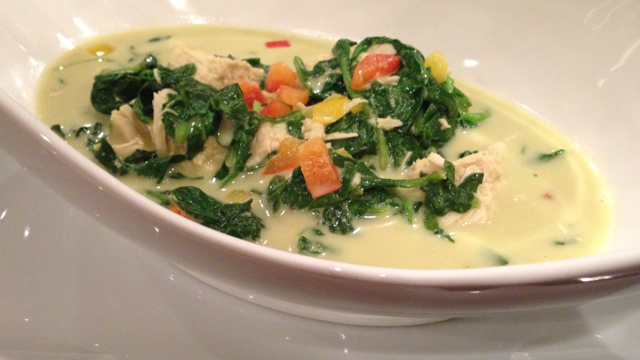 I love to fix Italian food, but like French food, many recipes takes much time to prepare and cook. 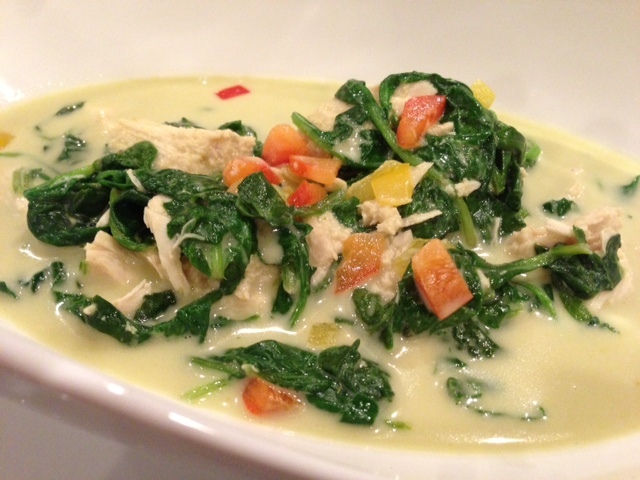 For those reasons, fixing French and Italian fare is not practical to fix on a school night. 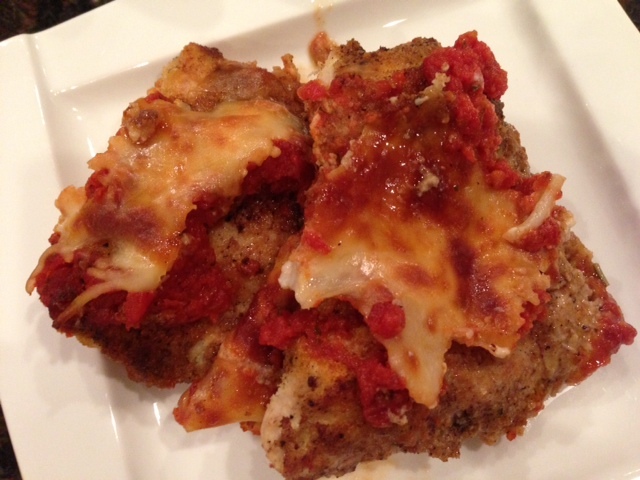 Today however I will share a quick way that will allow to fix Chicken Parmigiano in less than 30 minutes. 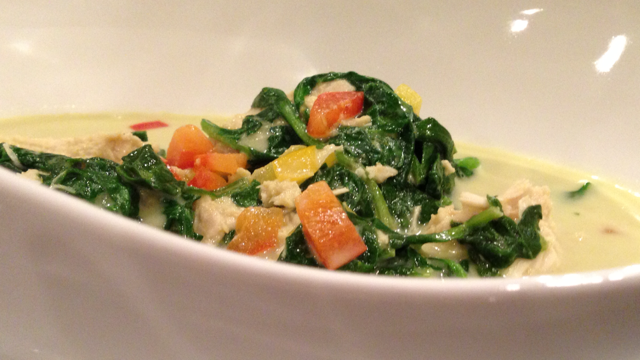 In a bowl, break 2 eggs and mix them with a fork. Add to it, the 1/4 tsp of salt, 1/8 tsp of pepper, 1/4 tsp of garlic powder and mix well. 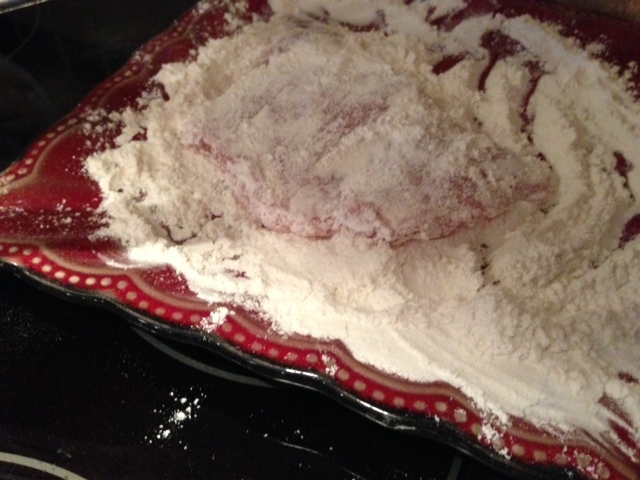 Then place the chicken breast in this mixture and turn it so that it will be well coated with the egg mixture. In another bowl, mix the bread crumbs with the parmesan. With your fingers, transfer the chicken breasts in the bread mixture and turn the chickem so that it will be coated with the bread mixture. 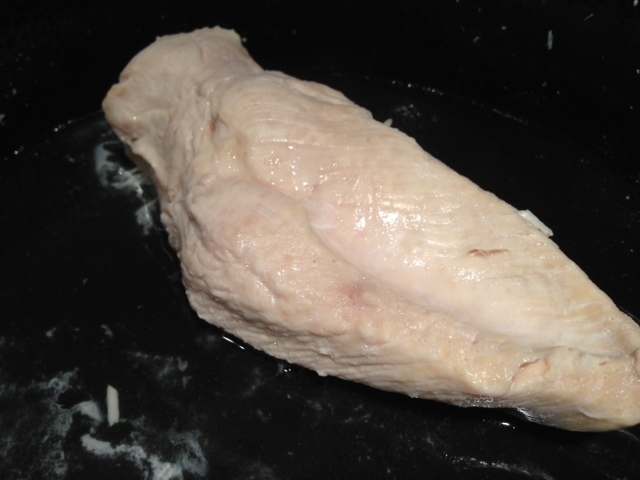 Take a large silpat or the deep flexipan ( previously laid on perforated sheet) and lay the chicken breasts on the it. 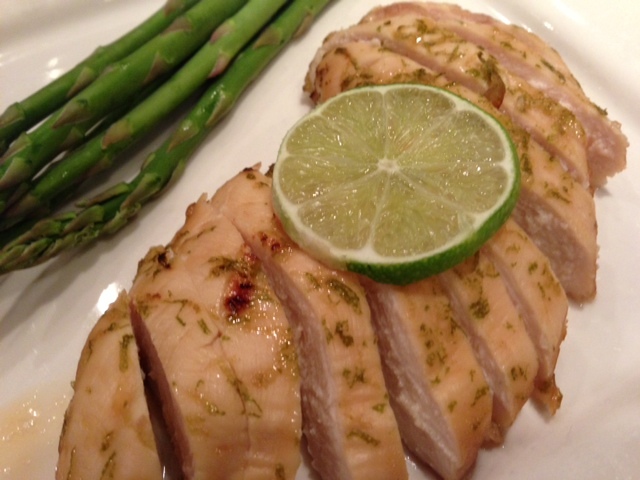 Use an oil spray or a vegetable spray and spray the chicken breasts with the oil spray. 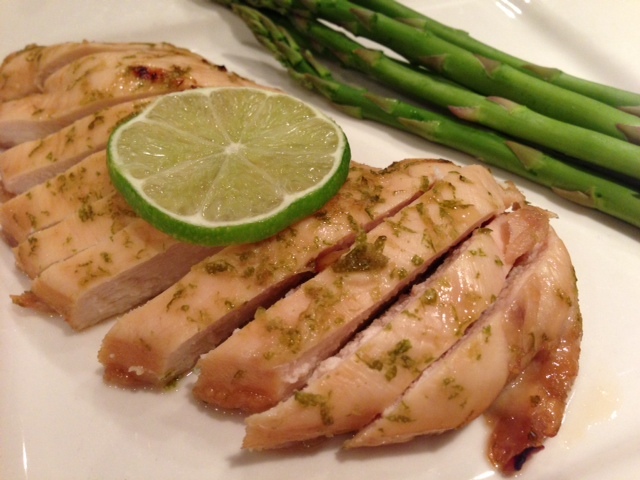 Place the chicken in the oven and cook for 13 minutes. 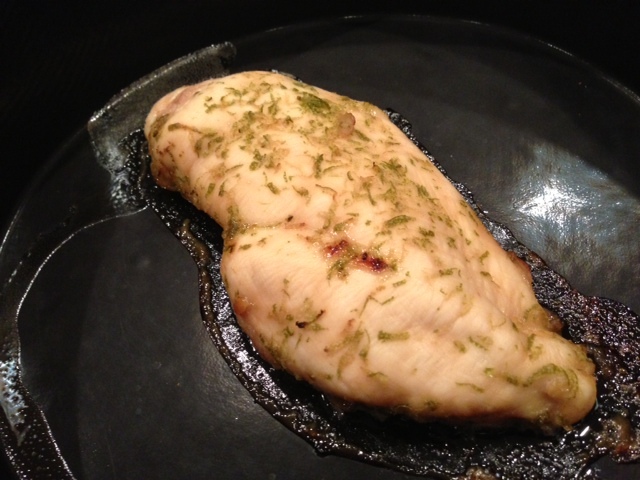 For regular bakeware, cook the chicken for 25 minutes or until it is done. 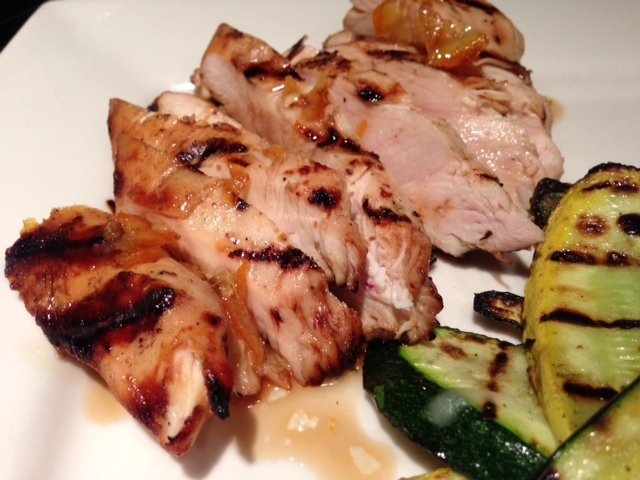 When the chicken has a nice golden color, remove it from the oven and drizzle the tomato sauce on it. Sprinkle the cheese and cook the chicken for another 5 minutes at 425 so that it can get a nice golden color. Et voila!!! I was so happy to have nothing on my calendar this evening because I wanted to spend a bit of time at the gym and play in my kitchen. Well, I had forgotten I needed to bring the kids to the eye doctor for their annual exam after school. Because it was a rather long visit ( my kids needed to have their eyes dilated), I did not get to the gym until late, and it was consequently a bit late when I got home to figure out what to eat. When I got home, Theo was already on the prawl for some food, so I knew that time was limited… It had to be quick and easy. I had a few chicken breasts in the fridge, brocoli and Lisa loves rice so our dinner became Steamed Rice with Coconut Crusted Chicken and Sesame “infused” Broccoli. 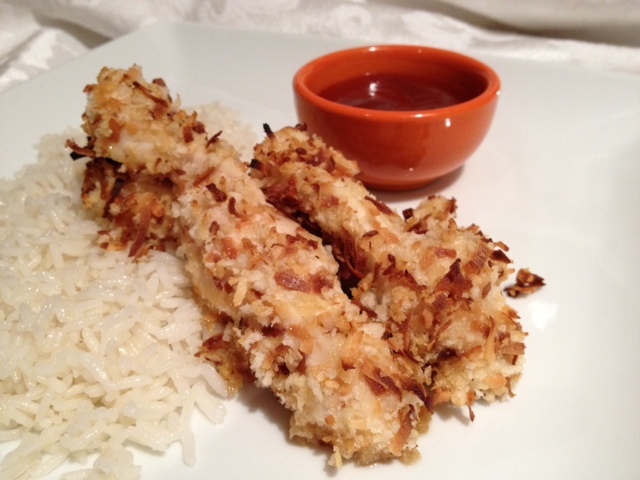 For the coconut Chicken tenders for 3: 2 breast of chicken, 1 cup of coconut flakes toasted, 1 cup of Panko bread crumbs, 1/4 tsp of salt, 1/8 tsp of pepper, 1/4 tsp of ginger powder, 2 eggs, 1/2 tsp of toasted sesame oil. If you do not have toasted coconut flakes, turn your oven to 375. Place 1 cup of coconut on a silpat and when the oven has reached temperature, place the perforated pan with the silpat and coconut in the oven for 12-15 minutes or until the coconut flakes are a brownish color and are no longer soft. When they are toasted to your liking, set them out and let them cool. Because we did not marinade the meat, you will want to tenderize the meat by pounding it. So place a chicken breast on the rectangular roulpat. Fold the roulpat on top of the chicken breast and with the rolling pin, pound the chicken so it flattens out and becomes evenly flat. 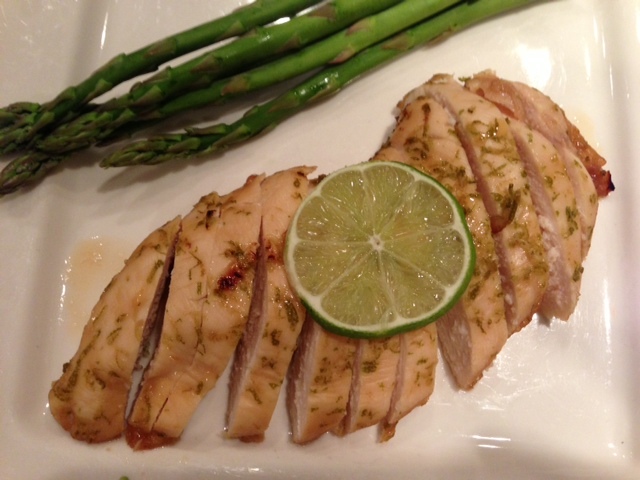 Remove the chicken breast from the roulpat and repeat the process with the other chicken breasts. 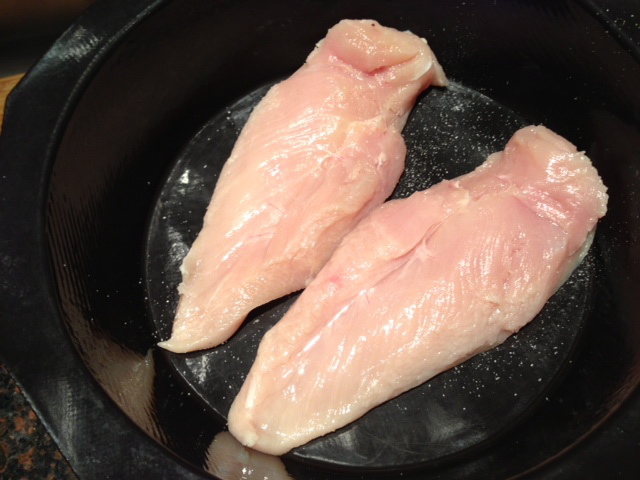 Place the chicken breasts on the chopping board and cut the breasts into tenders of about 1/2 inch thick. Set aside. In a bowl, break 2 eggs, and add the salt, pepper, ginger powder, and the sesame oil. Mix well. Empty the chicken tenders into this mixture and mix well to coat the chicken. Set aside. 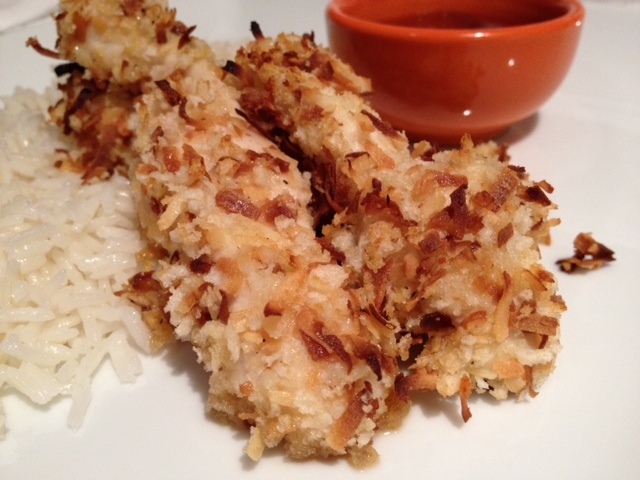 In another bowl, mix the panko bread crumbs and the coconut flakes and mix well. Take the chicken breasts out of the egg mixture and place them into the bowl where the bread crumbs and coconut flakes are. 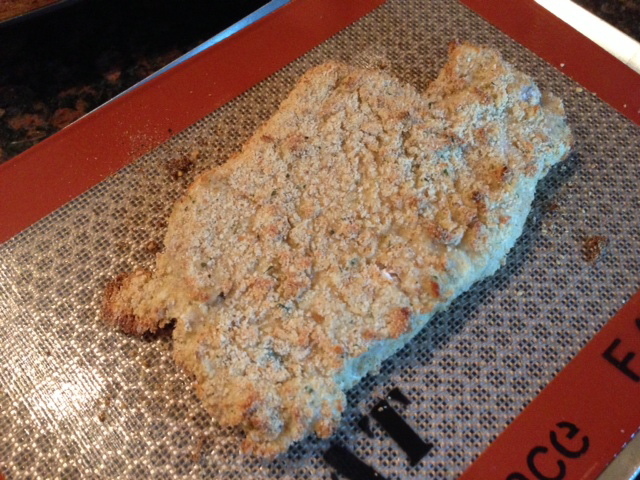 Stir well to make sure that the chicken tenders are well coated with the bread mixture. 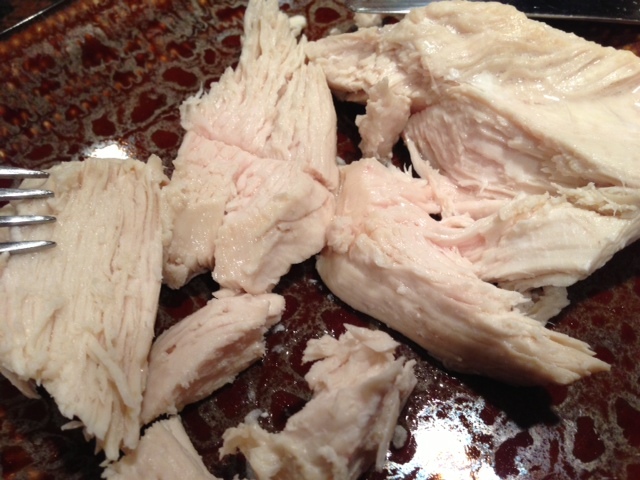 Place a large silpat on a large perforated sheet and lay the chicken on the silpat. 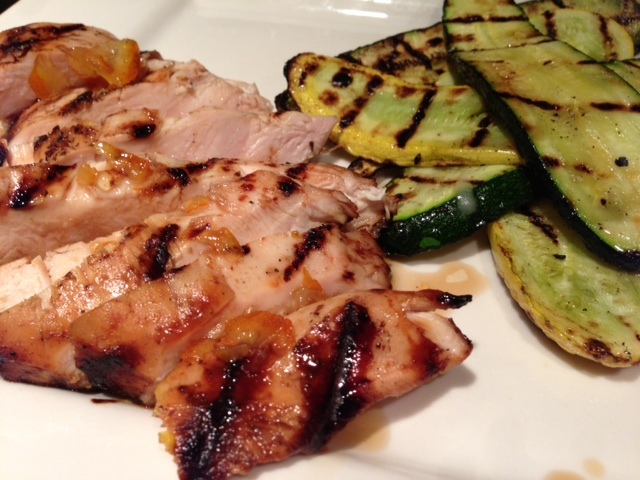 Cook the chicken for 7-8 minutes at 375. Et voila! I serve the chicken with steamed rice that i cooked in the round mold ( same recipe as the coconut rice except that i only used broth), and with Toasted Sesame Infused Broccoli ( recipe to follow) and I also serve sweet and sour sauce for dipping the chicken tenders.